Curious about writing for radio? Not sure how to start? What is a soundscape? What does a radio script look like? At what point do you start the story? How do you introduce characters? Why is exposition a problem? What are the BBC looking for? Come and experiment with the specific set of writing skills you’ll need to get your work heard. We’ll examine extracts of radio plays, practise writing techniques, and you’ll learn how to create characters, atmosphere and a sense of time and place using significant sound. 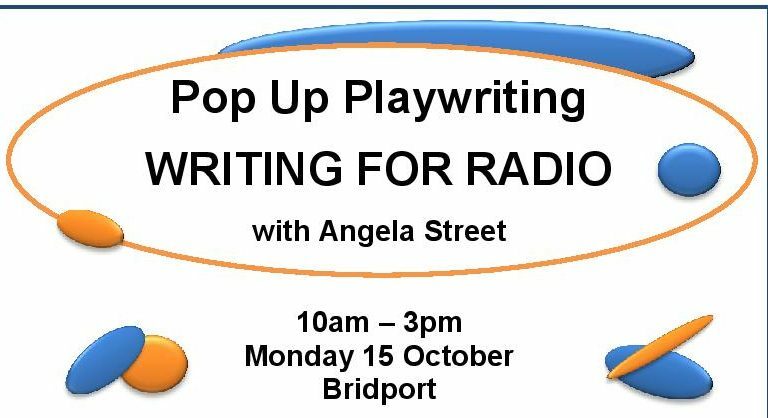 Angie trained in writing for radio with Paul Ashton (BBC Writersroom), was mentored by Tina Peplar, writer for Radio 4, and attended writing monologues for radio with Paul Dodgson, Writer and Sound Engineer (Radio 4). She also spent two years as a member of Radio 4 Writer, Nell Leyshon’s writing group. The BBC Writersroom has asked to see her next play for radio which she is currently writing. Angie is a professional member of NAWE (National Association for Writers in Education) and has taught on the Open University Scriptwriting module. She holds an MA in Scriptwriting and has taught writing for radio throughout the South West. She was recently awarded the Writers’ Guild Olwen Wymark Award for her work with new writers.